Saute the onion and garlic in the olive oil until softened. Add the chopped tomatoes, tomato puree, sugar and wine, then cook at a gentle simmer for 15- 20 minutes until thickened. Once the sauce is ready stir in the basil and season to taste. While the sauce is cooking, fry the gnocchi in a non-stick pan with a little olive oil until you have little golden nuggets of potato. Heat the oven to 200c/180 fan/400f/gas mark 6. Make the crumble. Add the flour, oats, butter, salt and pepper to a bowl and rub them together with your fingertips until they form into a crumble. Mix in the cheese. 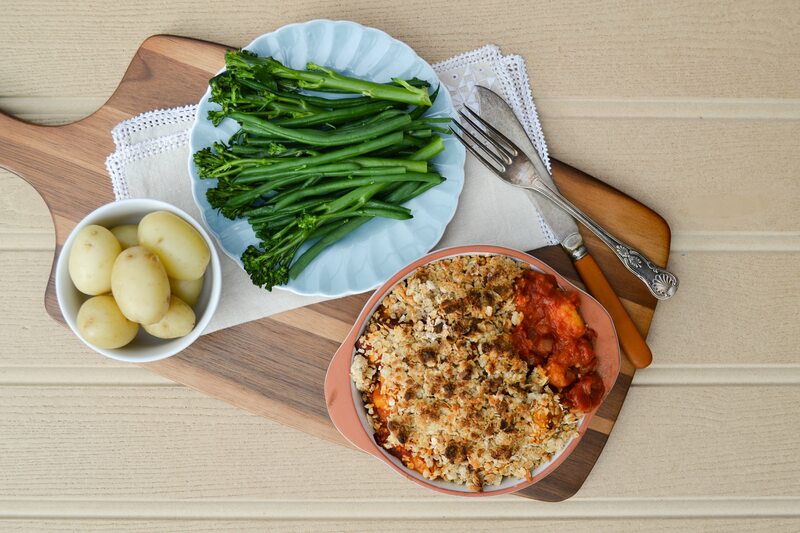 Mix the gnocchi into the tomato sauce, the pour it into one large or four small ovenproof dishes, top with the crumble mixture and bake for 15 minutes until the crumble is crisp and golden. You’ll find more than 600 family vegetarian and vegan recipes on the Tinned Tomatoes website.